Biography & Genealogy: Robert Beverley, Jr., Class of 1876. Genealogy: Born April 26, 1858, at the family home "Avenel", The Plains, Fauquier County, Virginia. Parents- Robert Beverley (b. 1820 d. 1900) and Jane Eliza Carter; Robert was their fourth son and tenth child. Paternal Grandparents- James Bradshaw Beverley and Jane Peter. Maternal Grandparents- John Hill Carter and Baynton Turner. Marriage- Richardetta Earl Carter, in December 1879; she was the daughter of Major R. H. Carter and Mary Welby deButts. Robert and Richardetta had three sons and one daughter (R. Carter, W. Welby, R. Bland, Fannie). VMI Record: Entered VMI in 1873 and graduated in 1876. Career: farmer at ancestral home, "Blandfield" in Essex County, VA. Death: December 29, 1928, at "Blandfield." 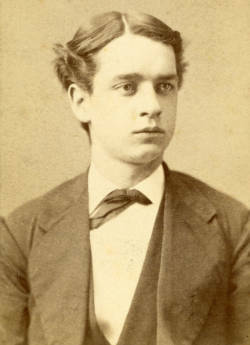 Robert's three brothers also attended VMI: James Bradshaw Beverley (Class of 1879), John Hill Carter Beverley and William Beverley (both Class of 1873).